Create private areas for patients with BLU-MED Privacy Curtains. Made of lightweight material, the curtains are easy to install and draw open or closed quickly and quietly. BLU-MED Partitions help to create separate work spaces and can be configured with windows and doors. Both systems are available for any BLU-MED medical shelter. The BLU-MED Container is made of a linear low-density polyethylene and measures 102" long x 41" wide x 49" tall. 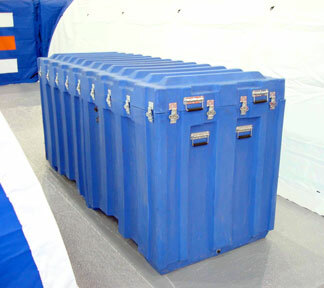 Each BLU-MED container can fit (1) BLU-MED medical shelter and is stackable when fully loaded. The BLU-MED Container is available in an assortment of colors to help identify different sections and/or purposes of a complete mobile hospital facility. BLU-MED medical shelters can be packaged in BLU-MED Carry Bags for transport in any vehicle, including the RapidSurge™ Trailer System. Each bag is designed to be carried by 2 individuals with the bag weight tailored to meet customer's needs. This reduction in weight and cube provides cost savings in transportation and makes BLU-MED medical shelters man-portable. The BLU-MED Shower, Toilet, Hygiene Unit is a 7' wide by 8' long shelter system that includes a single-basin sink, 1 toilet, 1 shower stall, self-priming pumping system, potable and a grey / black water bladder, a waste water and sewage pump, water heater, and plug-and-play quick connect hose kit. Designed as a stand-alone solution, the BLU-MED Hygiene Unit can also be connected to any BLU-MED medical shelter or BLU-MED mobile field hospital. BLU-MED supplies portable HEPA filtration systems providing 99.97% efficacy for cleaning the air of particles 0.3 microns and larger. Designed to easily attach to the BLU-MED ECU™, the unit is sized to manage air flows as high as 2,000 CFM (cubic feet per minute), providing clean air and a negative pressure environment desirable in an operating room.